Vulnerable to the lightest breeze. Where the base of trees and the ground are one. I stand waiting, my face bathed in the damp air. The forest is waiting too. Those Wild and Crazy Environmentalists! Last Saturday, January 22, was one of the coldest days of the winter in the mid-Atlantic region. But that didn’t stop a bunch of crazy people from plunging into the frigid waters of the Potomac River! And I was one of them. Our plunge into the river was a media-oriented, fundraising event for the Chesapeake Climate Action Network (CCAN). About 150 ‘plungers,’ ranging in age from 6-78, along with supportive friends and family members, gathered at National Harbor, at the river’s edge, just south of the U.S. Congress. We were a boisterous, upbeat crowd, and the exuberant atmosphere quickly dispelled my nervousness about immersing my body in probably the coldest water I’d ever encountered. During the lead-up to the plunge, we cheered, sang, and listened to encouraging speakers, including one intrepid Congresswoman. Donna Edwards is part of an unfortunately small group of Congress Members willing to speak out about the need to address climate change. And she proved her commitment Saturday by not just talking to the crowd, but by also plunging into the water. I could have continued sipping coffee, talking and laughing with my friends, and taking in the speeches and the music. But we had been called there for a bolder purpose. Before long, it was time to head over to the changing tents. I don’t know what the men’s tent was like, but the women’s tent was filled with nervous laughter, jostling elbows, and piles of clothes, as we ignored common sense and traded our winter clothes for bathing suits. Outside the tents again, we huddled, hopped, and ran in place in the icy slush at the water’s edge, waiting for the signal to run in. Then came the chant. ”3-5-0! 3-5-0! 3-5-0!” (the safe level in parts per million of carbon in the atmosphere). The crowd surged forward. My legs somehow carried me into the water and kept on going. Gasp! Almost immediately my feet were numb. I had imagined I would go in up to my neck, but I quickly decided that waist-deep was plenty deep. Very soon I turned around and began the walk back on feet that had no feeling. Fellow plungers displayed all manner of shock. Some screamed, some jumped, some clung to fellow plungers. Some went out farther than I did, while others decided that ankle-deep was deep enough. Meanwhile, on the shore, our warmly dresssed supporters cheered us on, and my friend Diane took pictures. Stepping out of the river, I was absolutely elated! I had done it! I had survived it! And it was exhilarating to be part of a crowd of people who ‘get’ global warming, who are taking action to address it, who are raising funds for an organization that is working hard to change public policy. I drew strength from that crowd of crazy environmentalists. After we plungers changed back into our warm winter wear, everyone gathered at a nearby restaurant to continue the celebration–indoors! I thank my friend Louise for reminding me that today is a special holiday in Israel. Today, January 20, is Tu B’Shvat, the beginning of the New Year for Trees. What a lovely tradition, to set aside a day to celebrate, honor, and enjoy trees. To Americans, January may seem an odd time to celebrate trees. After all, in our country, January is a time when deciduous trees are bare of leaves, dormant, waiting for spring. But in Israel it’s different. There the rainy season is ending, and the white blossoms of the almond tree, the first tree of the season to bloom, can be seen. In addition to a celebration of the many fruits and nuts that trees provide, Tu B’Shvat is a time to appreciate other gifts we receive from trees–shade from a hot sun, protection of soil from erosion, the many uses of wood, visual beauty. Tu B’Shvat is even a time to remember our own commonality with trees. According to the Torah, “man is a tree of the field” (Deuteronomy 20:19). Like trees, we too are nurtured by deep roots. We reach upward to the heavens, while standing firmly on the ground. When we do this well, we produce fruits that benefit the world–our good deeds. In America as well, some people are celebrating Tu B’Shvat today. Groups here and there will gather near trees to enjoy their beauty, to share in the eating of fruits and nuts, and to celebrate trees through music and poetry. For some groups, like one in central Ohio, today’s celebration will also be a time to reflect on the state of the planet–the destruction of forests and the warming of our climate. What might broadly be called the ‘food movement’ is a good thing. Eating locally, eschewing animal products, and eating fresh, minimally processed foods are all good steps for human health and for a healthy planet. A piece I would like to see included in the growing food movement is a commitment not to waste food. Americans waste a lot of it! Consider these facts: The U.S. Department of Agriculture estimates that Americans throw out 11 billion pounds of fruits and vegetables every year. That amounts to more than 35 pounds per person. And 25% of all edible food in the U.S. goes to waste, according to the Texas Cooperative Extension Agency. And most of that uneaten food ends up in the landfill; very little goes to nourish soil through composting. So why does food waste matter? An enormous amount of energy goes into producing, processing, packaging, and transporting food. If we cut food waste, we will save energy, which would reduce pollution and decrease global warming emissions. Think ‘recycle.’ When milk goes sour, make pancakes. Bananas beyond the pale? Make banana bread. Or freeze the bananas until you have time to make banana bread. Buy in bulk. You will likely waste less when you can buy just the amount you think you’ll actually use. Besides, buying in bulk eliminates the environmental impacts of packaging and processing. If you have more of a food than you’ll readily use, freeze some of it. You can write the date of freezing on a slip of paper and tuck it inside a rubber band around the frozen package. Then you might also want to make a note somewhere so you’ll remember to thaw and use the food at a later date. Practice ‘refrigerator consciousness.’ Try to keep track of what’s in the fridge and eat perishables before they go bad. Establish a compost pile. Food you wouldn’t be willing to eat can be returned to the earth where it can add organic material to the soil. 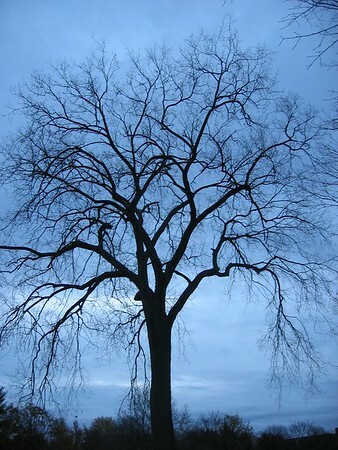 This is the time of year when I admire the bare form, the underlying beauty of many trees. With no leaves to hide their essential shapeliness, deciduous trees are pleasing to behold. Every leaf is gone and it is waiting for spring. I thank my friend Chip for sending me this beautiful and intriguing video. It shows a herd of all-white deer in northern Wisconsin. They are beautiful, ethereal-looking animals. According to the video, they are albino, but I wonder if that is correct. I did a little research and found that a few herds in other locations also include significant numbers of all-white deer. In these cases, the animals are not albino, but they have a recessive gene that leads to an all-white coat without the pink eyes typical of albinos. These other herds live in isolated locations where inbreeding has increased the prevalence of the recessive gene and therefore the number of white deer. Back in 1966, there was a buzz going around my community. A new high school was under construction, and it was going to be ultra modern! In fact, the advanced technology to be employed meant that the new building would be climate controlled. With air conditioning throughout the entire building, teachers and students would never again have to crank open a window in search of a slight breeze on those hot, humid, north Florida days. In fact, the sophisticated new climate control technology made windows irrelevant. Since no one would need to open windows for cooling any more, why bother with them at all? Hence, the brand-new, state-of-the-art high school was windowless. A year later I entered the much-hyped school as a student, and I found it a pretty unpleasant environment. As I recall, it took some getting used to–for students and teachers alike–to be shut into a room together, unable to see beyond the four walls surrounding us. My visual field extended no more than about 20 feet. No sunlight, no passing cloud, no tree could be part of my, or my classmates’, environment during most of the school day. Forget about a daydreaming gaze out the window. And did a lack of access to the world outside mean we were more focused on our schoolwork? I doubt it. Thinking back to my high school experience, I am reminded what a great invention was the glass window! How I take it for granted that when indoors, at least in most buildings, I am also part of the world outdoors because I can see it. With natural light entering the school only here and there through tiny windows in the outside doors, the school had to be lit entirely artificially. I wasn’t conscious of it at the time, but I now think that the lack of natural light, combined with the unnatural quality of fluorescents at that time, was a spirit dampener. But the lack of windows was not my main gripe about my climate controlled school. It was damn cold in there, especially in the mornings. With cold air having blown through the empty building all night, the first classes of the day were quite uncomfortable. Woe to those who forgot to bring a sweater or jacket to school in the morning. But the worst days at Forrest High School were the summer days. Perhaps the plant manager felt he had to combat the Florida summer heat by making the building even colder than it was during the school year. For me, attending summer school classes in that ice-cold building meant piling on layers and watching the clock. I lived for the next break when I could spend a few minutes warming up outside. During those breaks my spirit lifted, thanks to contact with the real, uncontrolled climate. Some years later, I had another, not-so-pleasant experience with climate control technology. In the late 1970s, I worked in an office building in downtown Washington, DC. Fortunately, the building did have windows. But, unfortunately, the decision to cool or warm the building was not determined according to the weather outside. Instead, some building manager had decided well in advance, on a date in late spring when the air conditioning would be switched on, and on a corresponding date in the fall when the heat would be turned on. Of course the weather only sometimes went along with the schedule. Consequently, we workers often shivered in the air conditioning on cold days, and when it was warm outside, the addition of central heat made us sweat. Complaints to the building manager were met with a shrug. The dates for switching on the AC and the heat were immutable and could not be changed. I am happy to report that in the final days of 2010, the federal Bureau of Land Management (BLM) overturned what could fairly be called a “no more wilderness” policy. “Wild Lands” status protects lands while Congress decides whether or not to accord them this country’s greatest protection, a designation of Wilderness. And that is a process that can take decades. Without the ”Wild Lands” designation, land is vulnerable to energy development, road building, motorized recreation, and mining. And once thus degraded, land becomes ineligible for Wilderness protection. Now, once again, publicly-owned “Wild Lands” will receive the same no-development protections as Congressionally-designated Wilderness areas. Thanks to this recent administrative action, important provisions of the 1976 Federal Land Policy and Management Act will be reinstated. Specifically, citizens can ask that the federal government set aside lands that meet BLM’s requirements for protection–areas larger than 5,000 acres that are roadless and free from human disturbance–until Congress can decide to grant or deny Wilderness protection to such lands. You are currently browsing the Earth Connection blog archives for January, 2011.